Somebody told me today! – "Just Another BlaH BlaH BlaH BloG." I wish someone had told me when I first began my journey into a life of my own that where I needed to begin was sitting on the floor, with my eyes closed. I wish someone had told me that my first step, the first step anyone must take is inward. I wish someone had told me when I felt I had nothing to offer the world that all I needed to do, was sit down and breath. That all I needed to do was learn the practice of opening to and discovering the true Self, sitting inside of me, quietly, and that from there the rest would come easier. I wish someone had told me that my true value and worth would be found not in attaining or gaining but in meeting this Self. That finding my way to her would bring me gold and riches that no worldly things could buy. I wish someone had told me when I was lost and desperate for direction and support that I was really longing to meet myself. That nothing else would soothe me until I first came to touch my own inner temple of divinity. I wish someone had told me when I was swimming in a sea of lonely thoughts, and diving into dark pits that I was being called into the dark underbelly for great reason, that I was being called into the very center of myself as to come closer to my root and bottomless source of light. I wish someone had told me when I began to run, divert, distract, over consume, point fingers, overwork, fight, create drama, choose everything other than love, that I was running away from my own magnificence. That I was running from it because I didn’t believe it was something I possessed. Because I didn’t believe in my own ability to give myself all I needed. I wish someone had told me I was the only one who could give myself what I asked from and wanted from another. That all I would ever want, all I would ever need, all I would ever desire, all I would chase and scour the earth for was waiting deep in the valley of my chest. That, that was where I needed to start. That there in the quiet of myself was where I would find my eternal river of wealth and value and that all I needed to get there was the breath in my chest and the patience and willingness to understand that I was, and will always be, the answer I am searching for. I wish someone had told me that from going within I would find housed within me was a tremendous light, my truest version of Self, a self-free of suffering and story, my own personal guidance system and a wellspring of wealth, wisdom and knowing. That if I committed to going inward I would, in fact, be guided to my greatest life and most joyful existence. I wish someone had told me that from going within I would meet the only person who could give me the love I longed for, the only person who could carry me through my darkest nights, the only person who could heal the hurt inside me through unconditional love, the only person who could truly love me and that, that person was my highest self. The self who knew of my greatness, my capacity, my truth, my limitlessness. That there behind all the tremendous noise my mind created, behind all my resistance to the quiet was all I had been looking outside of myself for. We are stitched together from stardust, we are balls of light. We are limitless beings with all the wisdom we are in need of. It is in us from the moment we are conceived. Somewhere along the line we got distracted from these truths and are working to re-align with them. Where ever life leads you, whatever you must face, know deep inside the marrow your bones lives your earth. Your home. You cannot ever loose it, it can never leave you. No matter where you run to, no matter what rabbit hole you fall down, you always have you. I want to take a moment to tell you, you are here at this moment reading this because your highest truth, your soul is always pulling you ever so gently into your own light. I want to tell you no matter where you journey, no matter what the landscape appears to be, you are being held, you are being loved, you are exactly where you need to be. 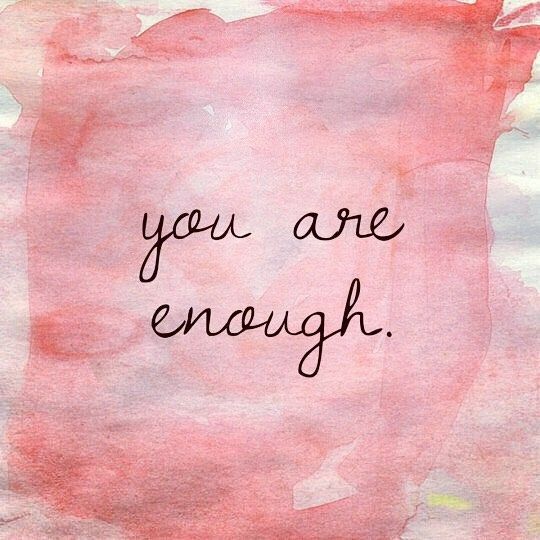 I want to tell you, you are already enough. That there are no holes to be filled, no cracks to be plastered. You are already enough, and everything you need is within you, rising on your breath and on your hearts beat.